Elton’s Case: The Tug Wyler Mystery Series. Andy Siegel. Rockwell Press. Copyright 2018. pb. 244 pp. ISBN # 9781981553327. Elton Cribbs was arrested and was brutally injured while being transported to jail. He was paralyzed from the waist down. A smart man, he researched everything legal about his case and the end result was that he was freed due to the real criminal confessing to the crime. But now Elton is suing the City of New York for causing his physical disability. 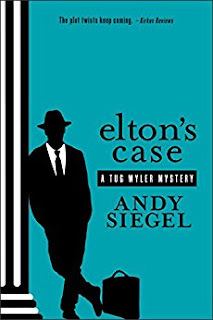 Tug Wyler becomes the plaintiff attorney, representing Elton Cribbs, facing a powerful defendant who has numerous witnesses who will testify that Cribbs was faking his disability and at the same time had participated in several scenes that caused his own injury. What confuses the issue is that the City of NY first offers $1 million to settle the case. Why would one settle the case if there was no fault involved, if the evidence was so set in stone to exonerate the defendant? So the lies parade before Tug: A guard swears that while so-called paralyzed she saw Elton actually stand up from his wheelchair and attack another prison. A examining physician, in a legal test called an independent medical examination, yields a report that says the plaintiff is faking, even though Tug was present for the entire exam and saw no movement or faking behavior. On and on the farcical “proofs” continue and yet the settlement figure from the City of New York keeps increasing substantially. The end of this riveting mystery, full of problems and opposition that confuse and upset Tug, is such a stunner that the reader will have to read it twice. What has Tug learned from this memorable and notorious process? What is justice and how can it fully cover years lost for imprisonment and a questionable and permanent injury? The reader also gets a good view of the personal injury field of the law where one learns that plaintiffs and defendants have a job, to win their case, whether that involves truth or lies on both sides. You won’t forget this case for a long time. Well-crafted and a good read!! !